"Because of this proximity, the planet circles its star in 36 hours and is heated to a temperature of over 4,000 degrees. It's not as hot as the sun, but hotter than many stars. At present, we do not yet know what such a planetary atmosphere looks like, or how it can evolve under such conditions." It is doubtful that the planet KELT-9b originated in such an orbit around its Star at such close proximity. The dust and gas from which it formed also would have had to be at a larger distance from its Star, otherwise Mass would not have been able to clump together as infalling Matter through Gravity to compress said Matter into the structure of a planet. At a distance far enough away from its Star, the planet's Mass would been cool enough to attract more gas and dust from its surrounding disk. Therefore, KELT-9b had to have evolved elsewhere and then somehow wandered into its present orbit where it has become too hot and molten to evolve further. 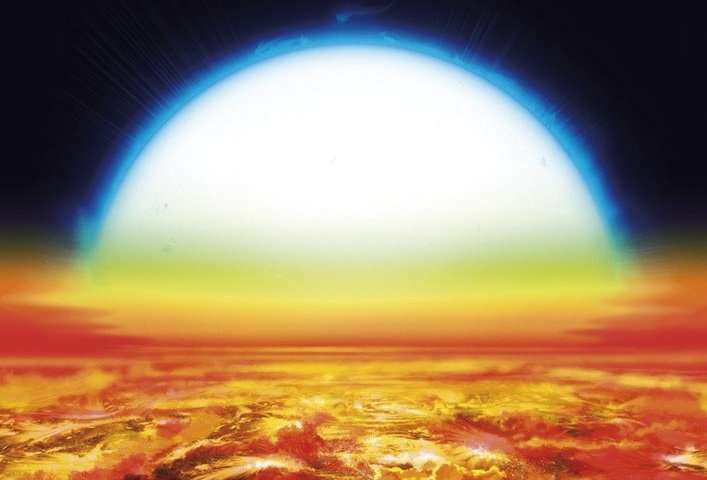 Or, could hot Jupiters like this have spooled out of the parent star directly, perhaps as the result of interactions with a binary companion in the primordial dense core? This planet, at 3 Jupiter masses, is shedding massive amounts of hydrogen due to this heat and proximity to the stellar wind (Yan & Henning 2018). Its composition is evolving rapidly. I think the planet and its star are pretty young. Some tens of millions of years or so. Or maybe in the past this was a binary star system and KELT-9b is no longer a star. Or, perhaps, just another example of my Theory of Stupid Design, driven by drunkenly chaotic deities.